While engineers and manufacturers work on solutions to close this gap in performance and demand, early adopters of solar lighting have several options available to help make their units more reliable. One of these methods include the use of a day/night photocell sensor. How Do Day/Night Photocell Sensors Work? Solar lighting systems are viewed by many individuals and businesses as the ultimate solution to sustainable illumination. However, the technology isn’t scalable enough (from a cost and efficiency perspective) to handle large lighting systems and continuous illumination requirements for long periods of time. Read on to learn about the mechanisms and advantages of this crucial component in solar lighting. A day/night photocell sensor is capable of autonomously detecting the presence of light in its respective environment. The units have no moving parts and they do not rely on connection to the grid for operation. This is why they work so well with solar lighting units. When in use, the component serves as a light sensitive resistor. It is highly resistant to darkness and offers low resistance when light is present. An example of a light sensitive photocell is a cadmium-sulfide photo resistor (CdS). These components can be found in street lights and other luminaries that require automation. For such applications, resistance can bottom out at millions of ohms (when exposed to dark environments) and reach hundreds of ohms under the presence of light. In addition to photocells, owners of solar lighting systems may also use timers to control or automate lighting functions. These units are useful for on-demand lighting controls. For example, project managers can set a timer to turn off lights automatically on the work site to prevent unnecessary use. Some timers allow the input of multiple timing configurations. This is useful for randomizing light output (mostly applicable to residential homes). The main drawback with using timers is its inability to adjust to environmental changes. For optimal functionality, operators must adjust the setting of the timer to match local sunrise and sunset periods. This could vary, depending on the season or month. Furthermore, timers aren’t sensitive to changes in weather. If cloudy weather calls for the lighting system to be used a couple of hours early, operators are forced to turn the luminary on manually. The use of timers or photocells heavily depends on your lighting needs. For remote locations, such as agricultural sites, walkways with low activities, hard-to-reach locations, perimeter lighting and etc., photocells are highly recommended. For unpredictable lighting requirements, including outdoor events, work site lighting, repairs and etc., timers are more suitable due to fine-tune control features. Day/night photocells make portable solar lighting systems more efficient. 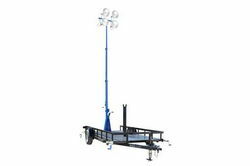 For instance, a solar lighting assembly on a cart, which is a superior solution for busy industrial sites due to quiet and reliable operation, has limited space for panels, batteries and lamps. Loading up the cart would either make it too heavy or unmanageable. This means that both battery capacity and panel efficiency can only be maxed out up to a certain point, due to space limitation issues. To reduce the strain on solar panels and batteries, operators can turn to day/night photocell sensors. For remote solar lighting systems, day/night sensors can increase the lamp’s lifespan by limiting operations to dark, nighttime conditions. This is also advantageous for luminaries that are installed in hard-to-reach areas, such as tall poles, ceilings and ledges. Maintaining or re-lamping in these locations are often costly and time consuming. Advanced photocell sensors are capable of detecting slight changes in light, such as the presence of dark clouds or haze. To conclude, day/night photocell sensors are essential components to solar lighting systems. They provide an easy and simple way to conserve energy, while improving the lifespan of lamps and efficiency rates of the entire unit.